Taking the train in France is convenient, easy, and now very, very fast on most lines. 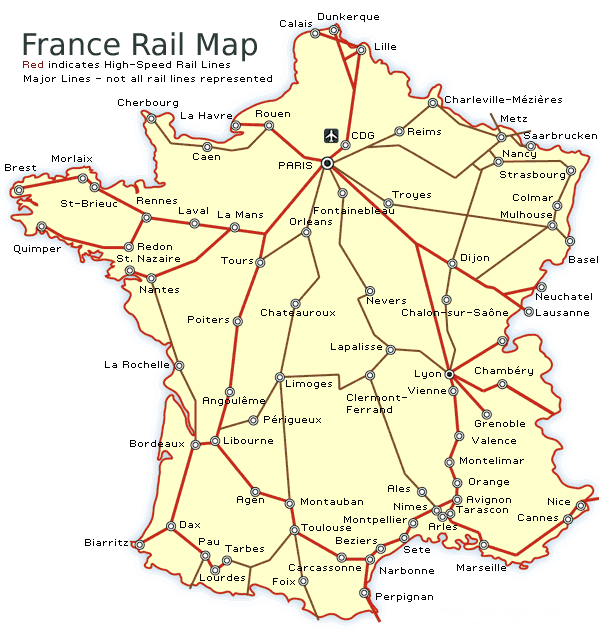 Below is a map of the major rail lines in France. 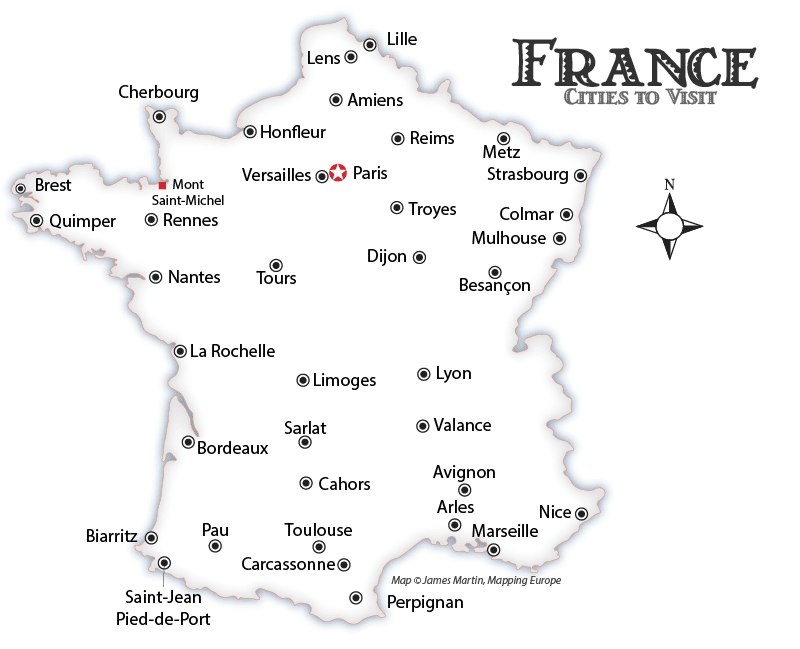 From Paris, or any city on the map that has a red line, you can take a fast TGV train between cities. For example, From Paris Gare de Lyon station the TGV train gets to Lyon in 2 hours and 40 minutes. The Eurolines bus is slightly cheaper, but takes over 7 hours making the same trip. Can you see the great vineyards by train? Why yes, and the trip I'm going to tell you about features dramatic scenery and some of the most famous vineyards and wine regions in France. You don't need to plan much, just buy your tickets at the stations and ride. Let's go. From Paris, you can head for Dijon, which is in the north of Burgundy. The trip should take a little over an hour and a half to the station called Dijon Ville. From there you can take a short hop to either Beaune or Chagny (Beaune has a TGV station as well). If you are traveling on a limited day Eurail pass, don't use a day of it for short trips like Dijon to Beaune. Beaune is a fine place to make a hub for your Burgundy visit. Stop into the Beaune tourist information tourist office on the ring road at 6 Bd Perpreuil and check out your options. Further down the train line you'll find Chalon-sur-Saône. It's marked on the map. This brings you to the heart of the Côte Chalonnaise, with famous appellations like les Mercurey, Rully, and Montagny. If fine old burgundies aren't enough, you can resume your southern journey toward France's culinary capital, Lyon, whose historic center is a UNESCO world heritage site. The Beaujolais region lies to the north of the city and the Côtes du Rhône region to the south. The northern Cotes du Rhone region is located between the towns of Vienne and Valence, between the larger cities of Lyon and Avignon, all worthy of a visit--or indeed a full vacation. But by the time the train rolls into Tournon you will be entirely taken by the scenery. You are in the bottom of a valley and up the steep slopes you will see the vineyards of Hermitage and Crozes-Hermitage, each block marked by huge signs denoting the legendary names of the producers. Stop here and explore Tournon sur Rhone and the Hermitage Vineyards. From here you can go on to Orange or Avignon, exploring the Provence region, ending up at the Rhone river delta, an area called the Camargue. Then a train trip across the French Riviera on to Italy perhaps? From Paris you can head east towards Brittany, Normandy and that little bump in the tidal marsh called Mont Saint Michel, which you access from the Rennes TGV station. From Paris heading west you can take the train to Alsace, another famous wine and food region. Paris to Strasbourg takes a mere 2 hoursa nd 20 minutes on the train. The possibilities are darn near endless. French TER trains are regional trains serving major cities and smaller towns of France on short-distance routes. French Intercités trains are faster regional trains that serve medium-distance routes. Some operate at night. They require seat reservations. France's nearly 200 mph TGV trains connect all major French cities. From Paris you can be having you pastis in Marseille in a little over three hours. It's very convenient to travel to adjacent countries on the TGV. You can take the France-Italy TGV from Paris and in 5 hours and 37 minutes be in Turin, Italy for $42 each passenger. City center to city center; you don't have to arrive at the station 2 hours in advance (15 minutes will do) and you baggage travels with you so you don't wait for it to be unloaded. Eurostar trains connect London to Paris in 2 hours and 15 minutes. If your vacation plans include lots of long distance train trips, you will save some money by purchasing a Eurail pass. A Eurail France Pass allows you to travel for three days within one month on first class, with discounts for families, groups, and youth (children up to 11 years of age travel for free). You can book tickets in advance of your travel using any of the links above through our partner Rail Europe. If you would rather drive drive: Rental and Lease Cars: France offers an option to lease a brand new car with great insurance if you are staying three weeks or longer. For cheap flights, check out the specials on OneTravel. For finding a hotel in France, see the booking box below (or use the recommendations on the map by clicking the hotel links. See a map of France with all our favorite cities marked on it. What are some awesome things to do in France? Viator has some ideas.